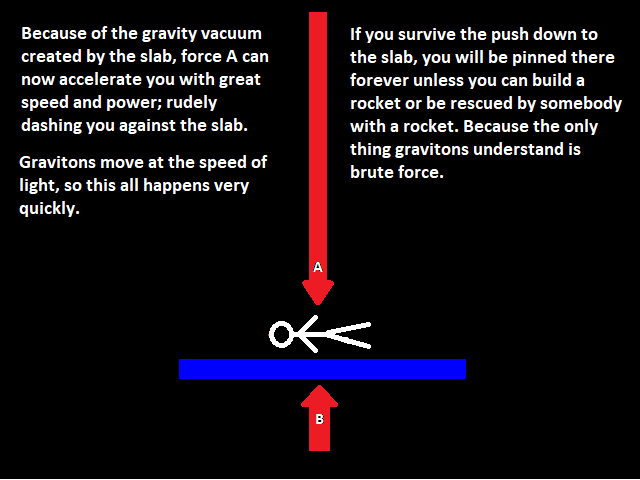 The “trick” to understanding gravity is to think in terms of pushing rather than pulling. The graviton is a theoretical particle thought to deliver the force of gravity. We will discuss it further below. Inertia is Isaac Newton’s First Law of Motion. 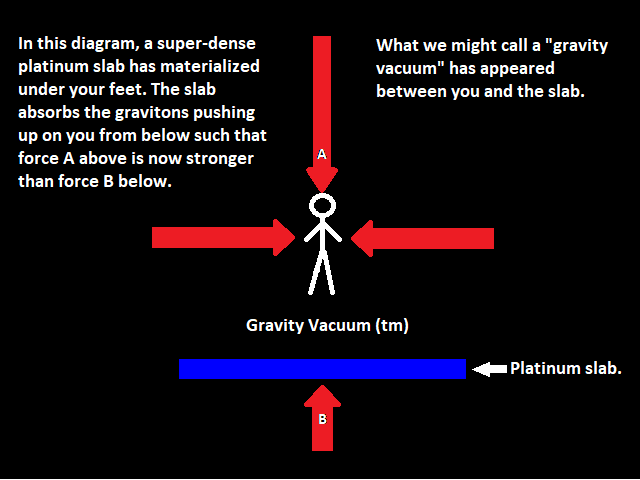 If the platinum slab is moving, it may not be there when you would have otherwise collided with it, and you would fall below it. Now the slab is no longer protecting you from force B, but rather from force A above. 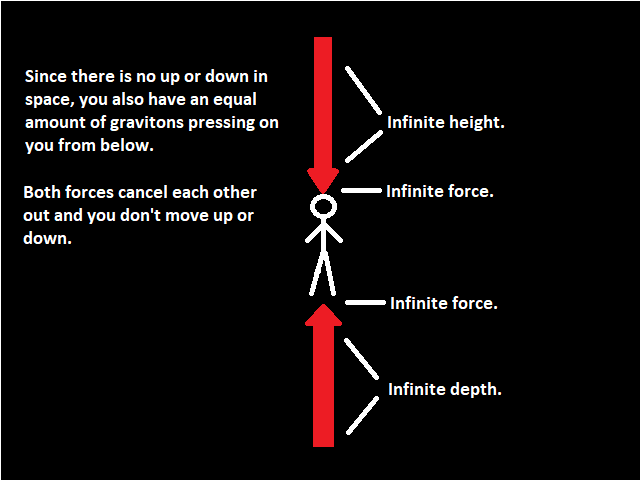 So, the graviton balance pushes you back upward. Lather, rinse, repeat, and you are now in orbit around the slab. While air & water push down on the outside of your body, gravitons push you from the inside by physically crashing into the nuclei of your atoms. So, as you are floating in the void of space, each one of your atoms is being constantly bombarded by a stream of gravitons coming from every angle such that they all balance out and you don’t move. But is space really filled, wall-to-wall, with gravitons? Why not? One thing I think everybody agrees upon is that gravity is everywhere. There is never a moment when gravity releases its grip on you. It is always there; morning, noon, and night; 24x7x365; forever. Sometimes light is there, but many times it is pitch dark. Some things are magnetic, but most things are not. Gravity is everywhere; all the time; like god. Gravity is the invincible iron-fist of the universe. 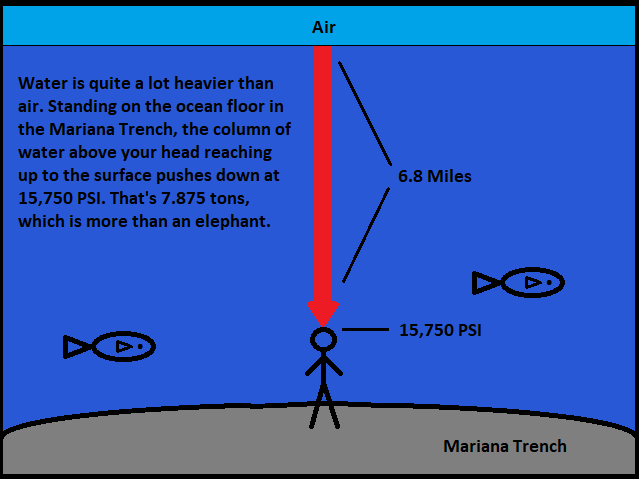 That’s why it makes sense to compare it to air pressure and water pressure as I have done in the cartoons. So, there are plenty of gravitons around. And we know that gravity acts on the insides of our bodies, like when your heart needs to overcome gravity to pump blood up to your brain. So, the idea that there is a perpetual tug-of-war on our atoms created by an ever-present swarm of gravitons is not so far-fetched. 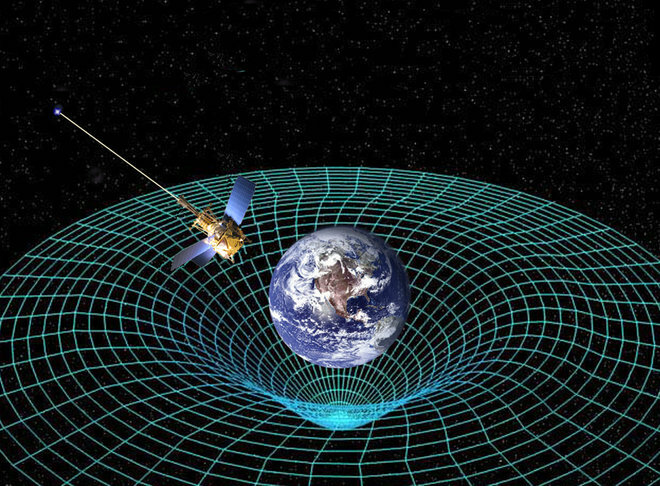 While Sir Isaac Newton invented the most famous theory of gravity, he did not put forth a mechanism for the transmission of gravitational force from one body to another. He thought that it would be irresponsible to do so given the current state of scientific knowledge. Basically, Newton didn’t know, and refused to pretend that he did (read more here). So, Newton’s theory was what we might call math-y. He invented a mathematical system that mapped pretty closely to reality, but was not a description of reality itself. Nevertheless, it was still a massive advancement in scientific knowledge. In fact, even today scientists prefer to use Newton’s equations in many cases because they are much easier than Einstein’s. 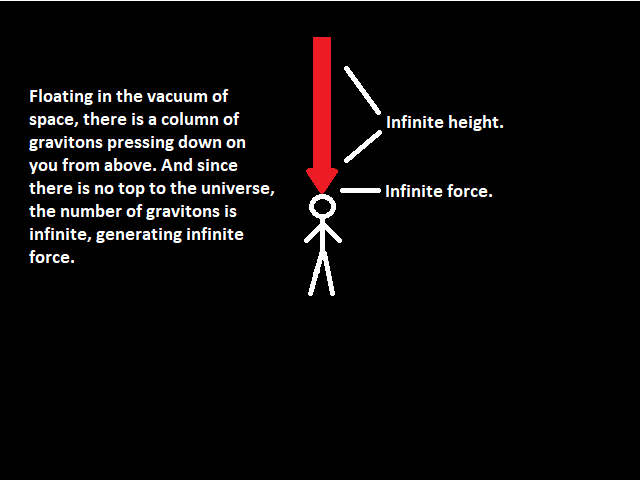 Some people claim that Einstein debunked the very concept of gravity itself. According to Einstein, the Sun does not pull the Earth but rather bends space such that the Earth has no choice but to follow the freshly-plowed fabric of space. But Einstein never defined the characteristics of that fabric. We are told that it is just a thing that bends. This explanation would only make sense if the trampoline were the top of the universe. 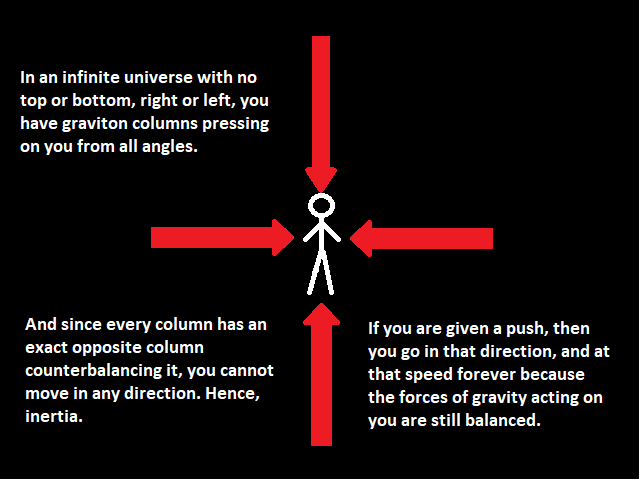 In our actual three-dimensional universe, wouldn’t the body be distorting space in all directions equally? Why would the marble spiral downward instead of upward, or to the left instead of the right? 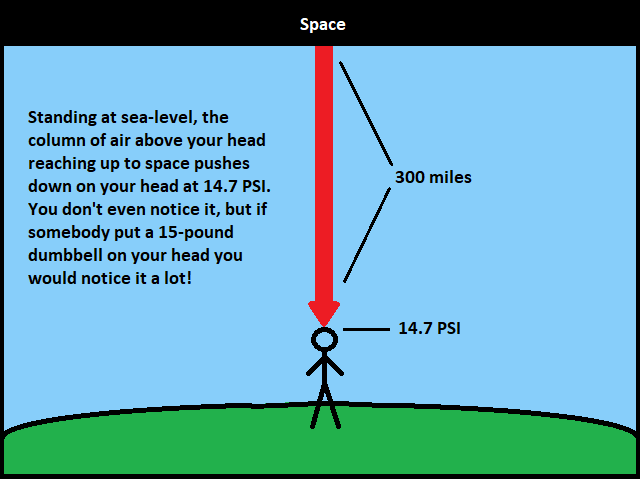 And keep in mind that the sun is moving through space at 43,000 miles per hour, where it allegedly plows a tunnel like one of Elon Musk’s boring machines; just bending space like crazy. Then the planets fall down the gravity well, following the sun. But then, at perihelion, somehow the planets get out in front of the sun. I suppose that if you rolled a bowling ball behind a boring machine it would catch up, but could it then blast through the rock itself and get out in front of the machine before orbiting back around behind? That doesn’t seem likely, but then again, we have no definition for the fabric of space. How fast does the bent space unbend? If gravity waves propagate at the speed of light, that doesn’t seem to be enough time for Pluto to squeak by before the tunnel closes. Or maybe it doesn’t close, and the universe is like a gigantic gopher warren. And what happens to the bent space? Let’s say that you have a Star Trek style warp engine in your car. Now, you want to drive from New York to Los Angeles, so you step on the gas, space is warped such that fly-over country is shoved down into a giant crevice, and New York & L.A. wind up right next door. You get out of your car, hop over the crevice, and head to the beach without a care in the world for the millions of people that you just massacred. Furthermore, as the Earth falls down the path plowed by the Sun, what is corralling it onto that path? The bowling ball would follow the boring machine because of the way the rock had been shaped. But what is being shaped in space? Whatever it is would have to be enormously durable to be able to corral an entire planet. Clearly, bending space cannot be a real thing. The energy required to bend space that contained matter would be unimaginable. And if you think that the Earth could be bent and then snap back into place like a rubber band, with no damage, then I submit that you might be a crazy person. The “mass bends space” model is shockingly lacking in common sense, not to mention, detail. The whole thing just doesn’t make any sense. Now if you want to say that mass bends the gravity flux that permeates the universe, then you would be onto something. A laser weapon concentrates a stream of trillions of photons on a target to heat it up and eventually burn a hole through it. So, photons have been weaponized. What about gravitons? In the cartoons above, the platinum slab could be considered a weapon fired at our stick figure. And indeed, if you could cause a sufficiently large mass to materialize near an enemy ship, you could cause it to crash. But then again why not just smack it directly? Of course, moving such a mass around would require an enormous amount of energy, which could no doubt be better used in a more-efficient weapon. Who knows what more we will learn about gravitons, but the prospects for anti-gravity vehicles and gravity weapons seem bleak. Astronomers agree that gravity causes stars, planets, moons, etc. to be spherical. However, they don’t explain exactly why all the molecules “pull toward a common center of gravity.” In my theory, the explanation is simple: the gravitons from an infinite (or perhaps spherical) universe converging toward any given point are all of equal strength, therefore molding matter into spherical shapes. But if the body is spinning fast enough, like the Earth does, the sphere can get flattened to various degrees by centripetal force. Another problem with Einstein’s model: if the Sun plows a tunnel through space, and the Earth rolls down that tunnel, how does the Moon follow the Earth? Is the Earth plowing another tunnel inside of the one that the Sun plowed? And while the Moon is falling toward the Earth, how does it manage to pull on the Earth’s oceans? In my theory, this is an easy problem: as the Moon flies over the oceans, it shields them from incoming streams of gravity that were pushing down on the oceans, thus enabling the tidal effect. And then there is the whole matter (ha, ha) of Dark Matter. Einstein’s theory of gravity is so far off on a galactic scale that enormous amounts of Dark Matter have to be theoretically added to galaxies to make the gravitational numbers come out right. It’s a rather huge elephant in the room. Instead of having a small army of scientists scrambling to discover the mythical Dark Matter, why not just admit that the theory is wrong? As Wikipedia put it: “In philosophy of science, dark matter is an example of an auxiliary hypothesis, an ad hoc postulate that is added to a theory in response to observations that falsify it.” Update: scientists have found a galaxy, exactly one, that conforms to Einstein’s theory. Ironically, this makes Einstein look even more wrong because it blows up the whole elaborate theory of Dark Matter that scientists were expecting to fix Einstein’s theory just as soon as one of those slippery Dark-Matter particles was finally caught. The idea that large numbers of particles can sail through your body is supported by the neutrino, which are smaller than electrons and have no charge. So, they pass through matter very easily and rarely collide with atoms. Billions pass through you every day. (This page has a photo of neutrino colliding with a hydrogen proton.) Photons can’t pass through your body, but gravitons can. So, there is a graviton flux. Photons are the quanta of the electromagnetic field. Similarly, gravitons are the quanta of the gravitational field, making the graviton a gauge boson. Ironically, bosons were conceived by Satyendra Nath Bose, and the abolisher of gravity himself, Albert Einstein.